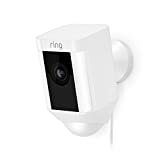 If old technology has now started to bother you and you have already started to check what is available in the market as far as security gadgets are concerned, let us introduce you to Ring Spotlight Cam Wired. This is the kind of solution that will be able to have an outstanding performance without you having to check about the batteries at all. As long as you have a power outlet you will just need to plug the device in and your property will be fully covered by “protection mode”. Once plugged in, your property will be on the palm of your hands! This is what technology can do today! Thanks to the internet connection and through a dedicated application, you will have the opportunity to have a look at any angle of your home by using a tablet, PC or handset. The unit is able to transmit highly qualitative video streaming and is also equipped with audio abilities. Listen and answer back to your friends or family members located at the property. If you are already triggered and want to know more on how and what the unit can do for you, follow the below sections where PROS and CONS are listed in details. Activate camera lights – As soon as the device identifies movement the lights will be automatically switched on and the camera focused on the identified movement. All in – You will be able to install and activate your camera by selecting the necessary settings thanks to the tools that are included in the box. Auto recording – If by any chance, you cannot check your application notifications, the camera is there to record the place where suspected motion has been identified. Ring video recording – The application enables you to save and share the recordings with your family members. Pick the colour you like – The product is offered in both white and black options, thus you have the opportunity to pick the colour that best fits your property design. Weather resistant – You can safely install the camera in the outdoors, regardless of the challenging weather conditions. It is case tested! After sales support – Once you face any type of issue with your camera, you can immediately contact the support team and they will be more than ready to assist you anytime. Subscription Fee – The application comes with a 30 – days free trial period. After the free trial period is over, the user has to make a purchase transaction in order to store the videos. Alarm sound – There have been identified some cases when the users report that the sound of the alarm is not that loud. As a matter of fact, it is important to emphasize that sound loudness is highly subjective and it is also depending on the outdoor environment. Have you ever thought about the amazing opportunities that Ring Spotlight Cam Wired can provide to you in terms of protecting your property? We prefer to consider it as a “Personal detective”, it is always there to identify possible threats and notify you accordingly. You can tell the unit which is the most important and worth the protection area of your indoors or outdoors and the camera will be focused on. Thanks to the wide coverage there will not be any uncovered angles. As soon as a motion will be detected, following the settings you have already set, the application on your device will inform you instantly. All the recorded videos will be stored on an online server, easily accessible through a normal subscription. You can share the videos with whoever you need to. The Ring Spotlight Cam Wired is perfectly adaptable to the weather conditions. It has been conceptualized to resist any kind of environment as it has been tested in the most challenging conditions. The unit is working via electric power, thus you will not need to take care of the batteries lifecycle. Always on as long as you have a functioning power outlet!